When talking about overall popularity and the sheer volume of collectors, basketball generally takes a backseat to baseball and football. However, strong international demand and the tendency for elite NBA players to become global stars, puts basketball rookie cards in a special category. 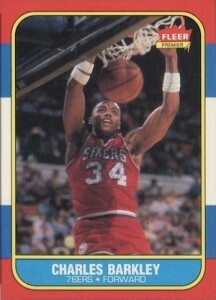 The following list counts down the top 20 basketball rookie cards of all-time. It can be difficult to determine the best order when dealing with cards from different eras, especially given the evolution of cards. A combination of value and historical significance were used to compile this list. This is by no means the definitive list of top basketball rookies, because there are just too many variables to base that list on. 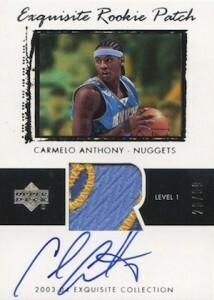 It is simply our view of the top 20 basketball rookie cards currently available to collectors. To be clear, this is not a list of the top players in NBA history, but instead, the top rookie cards. In order to make a clean list, we included a few caveats. First, there is only one card per player and no parallels are included. Also, as stated above, value is important, but it is not the only factor. Lastly, this list is based on things right now. In the future, the spots may shift and names may roll on and off. As expected, a few sets dominate the list. Hobby product legends, 1961-62 Fleer, 1986-87 Fleer and 2003-04 Exquisite, all have multiple cards on the list. Think we missed one? Feel free to add it in the comments. Follow the links to shop for singles on eBay. Hakeem Olajuwon, or Akeem as he was known at the time, does not receive the hobby love he deserves based on his accomplishments. His 1986-87 Fleer rookie card checks in at 20, but "the Dream" is an NBA legend. 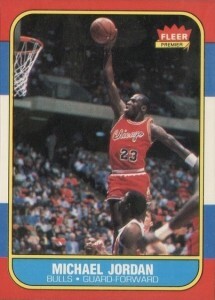 This is the first of several cards from the iconic 1986-87 Fleer Basketball set to be featured on this list. Arguably the next most influential set in basketball collecting after 1986-987 Fleer, 2003-04 Exquisite is representative of what the hobby has become. Carmelo Anthony is still seeking his first title but the historic 2003 NBA Draft class has been a major component of the last decade of professional basketball. The on-card signature, jersey patch, print run of 99, and brand recognition set it apart from all other modern brands. Kevin Durant took the OKC franchise on his back after the tumultuous relocation from Seattle and in a few short years, had them in the running for a title. Like Carmelo Anthony, his current accolades don't compare with any of the greats on this list, but Durant is primed for big movement as his peak years are approaching. 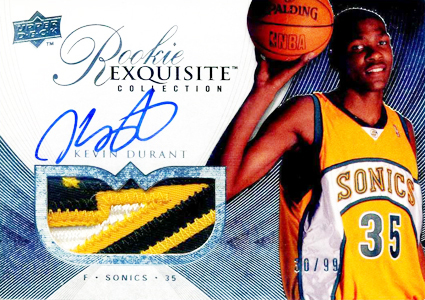 The horizontal layout gives Durant's 2007-08 Exquisite rookie card a different feel, especially in comparison to the rest of the rookie cards that are shown. One can wonder what Karl Malone could have done if Michael Jordan had never existed. While Jordan owned the 1990's, Karl Malone was regularly part of the team that came up short of the ultimate prize. 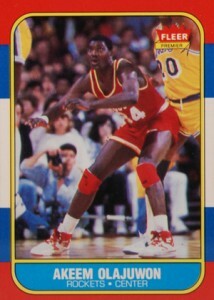 His 1986-87 Fleer rookie card is another top basketball rookie option and the second on the list from the historic set. Dwyane Wade is a star in his own right. History will likely remember him as a great player who needed an even greater player, specifically Shaquille O'Neal and LeBron James, to push his teams to the next level. However, it is unfair to diminish the value of someone's skills because they are not always viewed as the best player on their team. 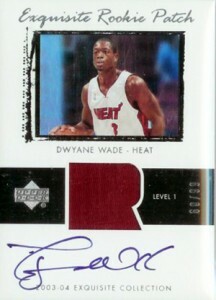 Wade's rookie card from 2003-04 Exquisite may again fall in second place to LBJ, but this is arguably the most valuable modern set in the hobby and Wade is a huge reason for that. 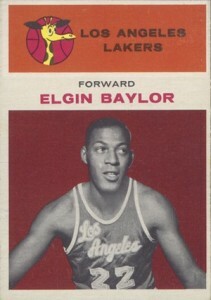 The first card from the impressive 1961-62 Fleer set, Elgin Baylor is an example of a terrific player who has seen his legacy buried by time. The lack of titles has something to do with it, but Baylor's rookie is still has earned a spot among the greatest basketball cards of all-time. Charles Barkley is another player who can blame Michael Jordan for keeping him from an NBA title. Chuck was a dominant player, despite being undersized. His rookie card won't break the bank, but just because all the cards from 1986-87 Fleer seem reasonable in comparison to the Michael Jordan rookie, does not mean that they don't deserve recognition. "The Big O" is a highly-decorated guard who is widely considered one of the best players in NBA history. 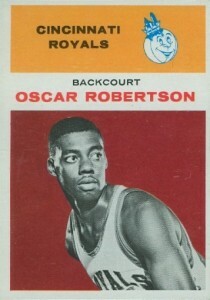 This Oscar Robertson rookie card is more work of art than cardboard memento. The colorful background and black-and-white image combine to evoke a nostalgic feeling. 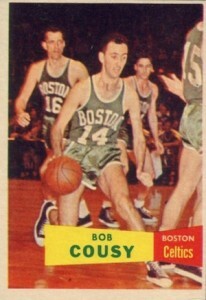 An important part of the Boston Celtics dynasty of the 1950s and 1960s, Bob Cousy's rookie in 1957-58 Topps remains very notable and valuable despite being among the more commonly found cards in in the set. The vintage feel is in full effect on this early basketball card. This card screams the 70's in the best way possible. Julius Erving was a player that was well ahead of his time and his rookie card from 1972-73 Topps is a reminder of how great a base card can be without the need for foils, Refractors or Prizms. 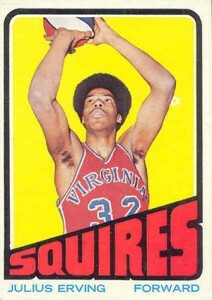 At this time, Dr. J was a member of the ABA's Virginia Squires. 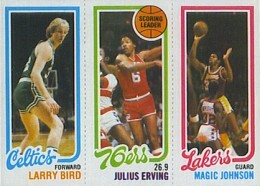 Although the cards for the NBA and ABA were found in the same set, the two leagues would not merge until 1976. 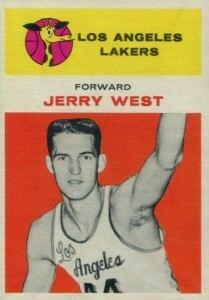 The logo himself, Jerry West tends to be remembered for that bit of trivia more than anything else. But West was a great player and 1961-62 Fleer is a terrific set. 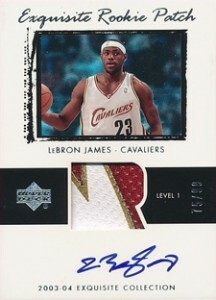 Fleer has seemingly produced some of the most timeless designs in basketball collecting, and this might be the best. Also, it is amusing that the Lakers used to have a giraffe logo. As an offensive genius, Pete Maravich has achieved a nearly-mythical reputation. Injuries and an untimely death robbed the world of the greatness he possessed, but the "Pistol Pete" nickname is still ingrained in pop culture. 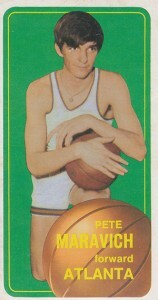 Maravich's rookie came in 1970-71 Topps and is the best card from the product. The tall-boy format may not appeal to everyone, but it has come to represent this early period of basketball collecting. 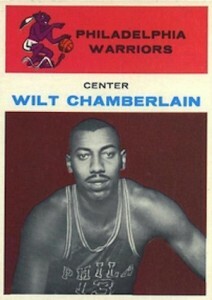 Wilt Chamberlain was a scoring machine and still holds the single-game record with 100 points in 1962. His rookie card is the jewel of 1961-62 Fleer. While he is not the only big rookie name found in this product, as evidenced by other cards on the list, Chamberlain is the clear favorite. The deep maroon background gives the card an added boldness and it is easy to see why this is considered one of the best sets of all-time. 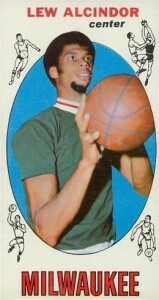 Just Lew Alcindor at the time, the world would know him as Kareem Abdul-Jabbar. With a height of nearly 5 inches, the tall boy format is appropriate for the 7'2" Abdul-Jabbar. Although the design is not the greatest, especially the multiple cartoon drawings and bright blue background, the significance of this 1969-70 Topps rookie card is clear. Kobe Bryant is the closest thing we currently have to Michael Jordan. The hunger, the passion, and the success are all on display each time he plays. Although Jordan would have several more years left at this point, Kobe Bryant headlined the next generation of players that would carry the league into the new millennium. This changing of the guard was not limited to just the court. 1996-97 Topps Chrome was part of the evolution that spread across the collecting world. New technology, rare inserts and parallels took card collecting to a new level. 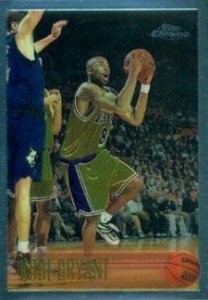 The Kobe Bryant Refractor parallel has proven to be especially popular and valuable. LeBron James is that rare athlete who can dominate when he chooses, but has no problem sharing the load. More Magic Johnson than Michael Jordan, James has already put his name among the all-time greats. While his rookie year was a monumental occurrence for the NBA, 2003-04 Exquisite brought a similar significance to the collecting world. For the first time, a high-end and luxury product was available and it just so happened to coincide with one of the strongest rookie classes in history. With only 99 cards, values will continue to push higher, with no end in sight. As the first major basketball set after 1948 Bowman, 1957-58 Topps includes some prominent rookies from this early period of basketball following the decade void in cardboard. However, there is no question regarding who is the top option. 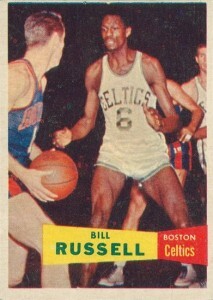 Bill Russell was a man among boys and his rookie card is a vintage favorite. The very simple card includes a large grainy image with a small name and team text box at the bottom. A rookie card with just one superstar Hall of Fame player is normally sufficient enough to place it high on the collecting radar. This special card from 1980-81 Topps takes that to another level, featuring three Hall of Famers and including the rookie offerings for both Larry Bird and Magic Johnson, alongside Julius Erving. While the three-in-one format has been beaten to death in the years since, this is a rookie card for the ages. George Mikan is not generally mentioned among the other players on this list. As one of the first dominant big men, he was an early star of professional basketball, but the game is so different now, it is hard to consider him on equal footing with the others. However, his relevance to the game is unquestioned and his rookie card is the biggest draw from the very first national basketball release. 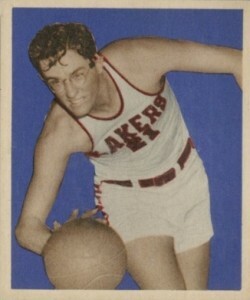 1948 Bowman was the beginning of basketball cards and that cannot be overlooked. The simple card is nearly a square and includes a black-and-white image and colorful purple-blue background. It may sound like a broken record to some, but Michael Jordan will never be overtaken. All players will be compared to him, and will come up short. 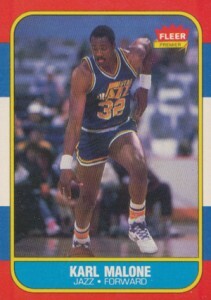 His 1986-87 card is one of many significant rookie cards found in the product, but there is no comparison when it comes to the top overall basketball rookie card. "Air Jordan" is on full display in this iconic card, which showcases him with his tongue out, going up for another gravity-defying dunk. In the basketball collecting world, the Michael Jordan rookie is always going to be above the rim, while the rest remain flat-footed, watching in awe.